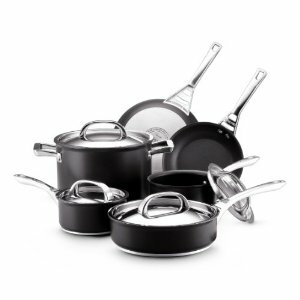 If you are looking for the almost perfect cookware set, then the Circulon Infinite 10-Piece Cookware Set is one you need to consider. These pans include the classic Circulon Total nonstick system that has been rated for longevity in various testing scenarios, the hi-low ring that helps protect the cooking surface, and best of all the ability to put the pan in the dishwasher! This is very unique among nonstick cookware. The stainless steel base and encapsulated aluminum core of the Circulon Infinite line is the key to evenness of heating in this set. A nice design feature is the stay-cool cast stainless handles and the ability to move the pans from stovetop to oven (up to 500 degrees F). The grey colored exterior is quite handsome and adaptable, and its backed by a limited lifetime warranty. Exterior: Made from hard-anodized aluminum, with a non-stick surface for easy cleaning. The stainless steel base encapsulates around an aluminum core for even heating, meaning no hot spots. Interior: Features Circulon's TOTAL nonstick system for performance and durability. The cooking surface features Circulon's Hi-Low ring design. This unique design is a system of raised circular grooves which limits the amount of nonstick surface that comes in contact with your cooking utensils. Handles: Cast stainless-steel riveted handles, stay comfortably cool when cooking on the stove top. If you have sensitive hands, I would suggest using a towel or oven mitt when touching the handles. Lids: Heavy-gauge stainless-steel lids, that form a great seal. Lids are not stay cool, so be sure to use an oven glove or towel. Cooktops: Suitable for all stove types, including induction and glass tops. Dishwasher: Yes, these are dishwasher safe. One of the few cookware sets that are actually dishwasher safe. Cleaning the high-low grooves: To prevent food build up in the hi-low grooves make sure to clean your cookware after each use. If your cookware begins to stick you might have a build up of food and grease in the grooves. If this does happen, mix three parts water to one part white vinegar and boil in your pan on medium heat for 5-10 minutes. Let stand until cool and wash with warm soapy water and a soft nylon brush, rinse and dry. Conditioning: Before you use your cookware for the first time, rub the inside lightly with vegetable oil and wipe off any excess with a paper towel. Doing this periodically will help retain the easy release of your cookware. Cooking with Infinite: Do not cook on high heat. Infinite conducts heat at low temperatures so only use a low to medium heat. This will not only help retain the non-stick coating, but high heat can cause your food to stick. You should also know that using cooking sprays or cooking with high heat will void the warranty. Do not use cooking sprays. Spray oils will burn at lower temperatures causing the cooking sprays to burn into the non-stick coating which will create a build up. This build up will not only cause your food to stick, but will damage the pans coating and give your cookware a "rusty" look. Circulon suggest that you use butter, margarine, olive oil or peanut oil to add flavor when cooking. Warranty: Circulon's Limited lifetime warranty guarantees that your cookware is to be free "from defects in materials and workmanship under normal household use for the lifetime of the cookware." You should also know that the "warranty does not cover damage caused by accident, misuse, abuse, commercial use or incidental or consequential damages." Some of the potential problems with the Circulon Infinite set include heaviness and reports that the handles do NOT always stay cool, which is a definite safety issue. Finally a greater size difference in both the sauce pans and skillets would have been nice. Overall the buyers of Circulon Infinite seem to be long-time Circulon lovers. Their response to this line has been very favorable. The pans seem to perform very admirably in a variety of situations and stand up to on-going use. In particular customers reported they were very happy to see that the pan had a flat bottom (a problem reported in some of the other Circulon pans). "Circulon produces the best nonstick product on the market." "My food cooks evenly, I even use less butter and oil"
"The cookware is of solid construction and heavy stock." The only real negative was that the handles are not stay cool handles, nor did they have the signature grip found on the majority of Circulon pans. In designing Circulon Infinite the manufacturer seems to have been striving for the Cadillac of their line. While there are a few minor drawbacks, overall the benefits of this cookware set outweigh those flaws. Consumers have been very happy with their purchases even though the line is at the high end of pricing for nonstick cookware. Overall this appears to be a good investment. We found the best price to be at Amazon, with a discount of over 50% off retail. Plus you can get it shipped free with Super saver shipping.